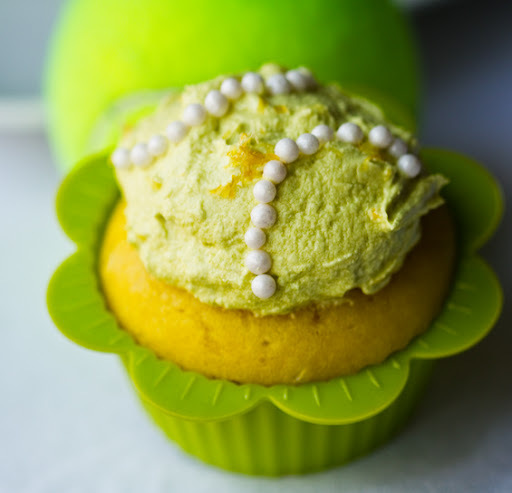 These lively Lemon Lime Vegan Cupcakes are totally Wimbledon inspired. As a long time tennis lover (watching and playing) I always get excited when prime tennis season rolls around. 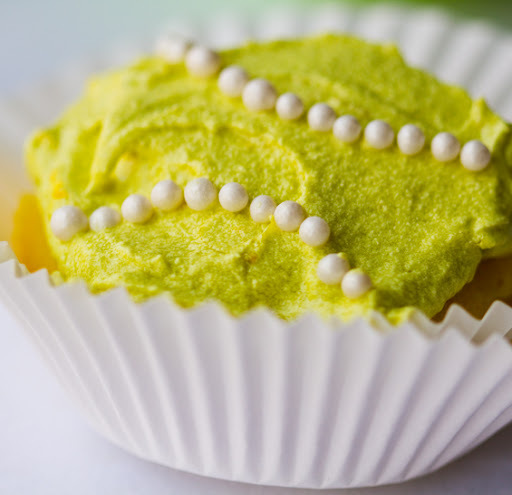 So tennis ball cupcakes it was!.. 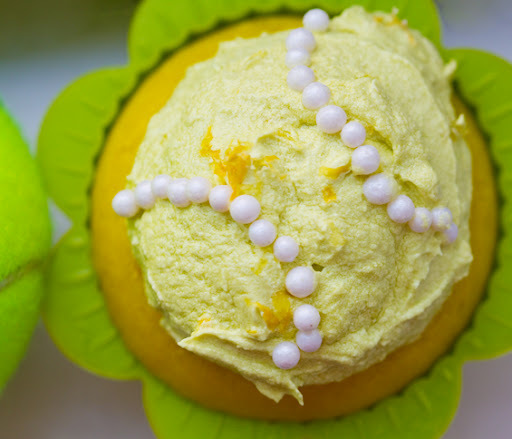 Tennis Ball Cupcakes. 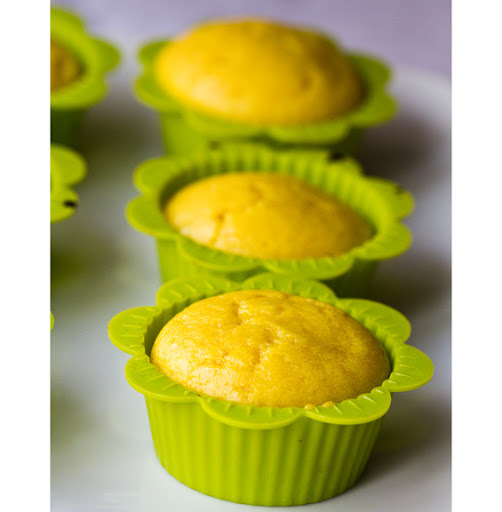 Zesty lemon cupcakes, moist from vanilla soy yogurt as the egg-replacer - a hint of olive oil. 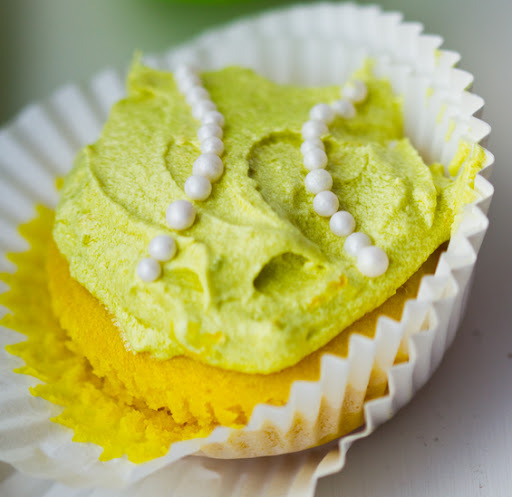 The lemon cakes are topped with a creamy vanilla butter cream frosting that's accented with fresh citrus flavors - the tennis ball colored "food coloring" is all natural. The review from my taste-tester: "Mmm! So good. I need another one! Best cupcakes ever. So GOOD!" - followed by grabbing a second cupcake without pause. And contemplating a third. But deciding to wait until after dinner for another. My review: Refreshing! 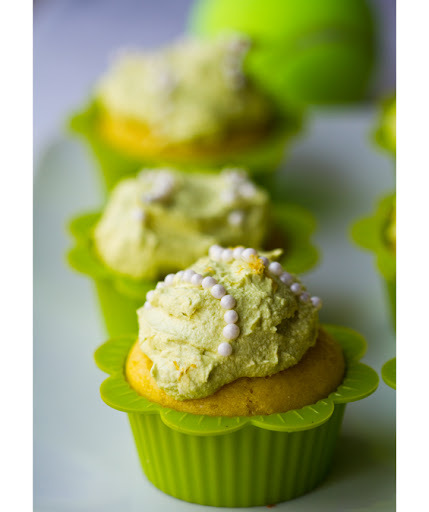 Summery, light citrus flavors remind me of fluffy lemon pound cake dolloped with zing-ful butter cream frosting. 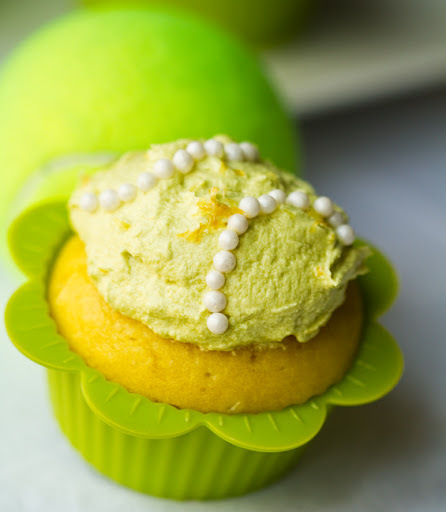 Dive into one of these fuzzy green tennis balls and enjoy some tennis watching with me! The recipe.. 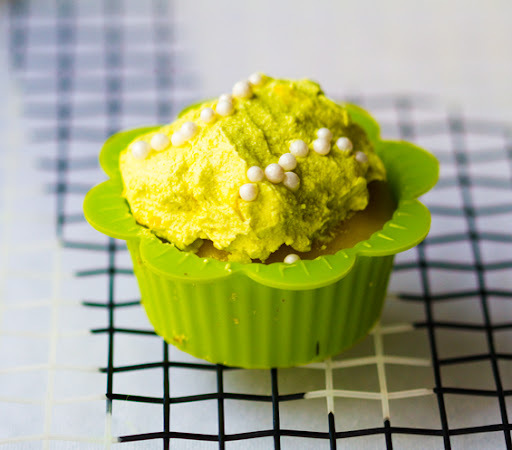 This lil guy was my mini 'taster cupcake' - and he tasted oh-so-good!.. 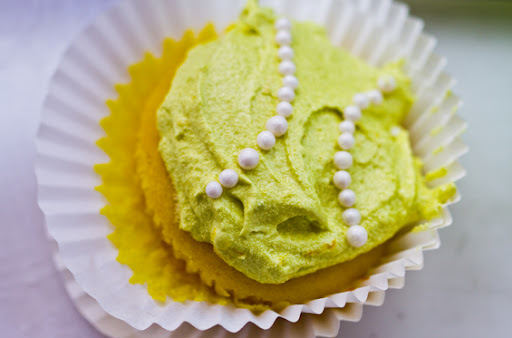 This is a fun recipe because of all the fun yellow-green colors. 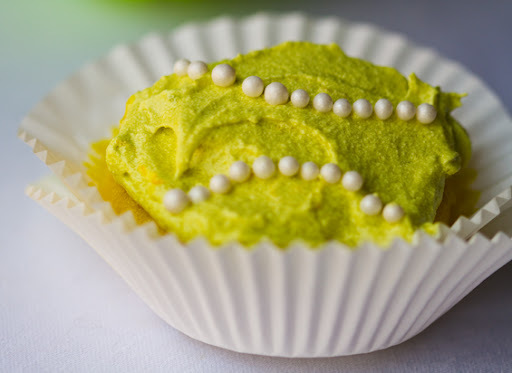 For the white tennis ball "stripes" you can either use candy dots like I did - or you can just use a white frosting - via a skinny frosting tube. It was quite a painstaking job to dot on these white decorating dots - but I liked the elegant end result. Yay Tennis! Like I said, I've been playing tennis all my life. I have a funny video of me at age 4 whacking a tennis ball right into the video camera filming us - I then shyly walked off the court as my sister laughed and laughed - she can be heard in the background sound dying of laughter. Despite that memory of humiliation - I adore tennis. I played all through high school as well. Any fellow tennis fans out there? 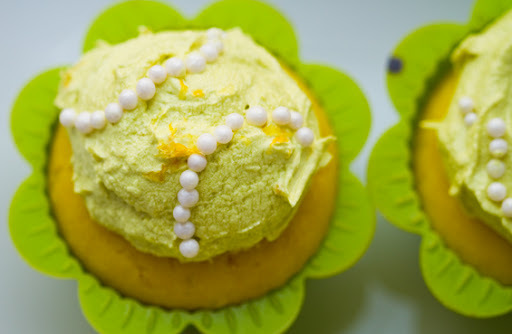 So I hope you toast to tennis season with one of these tasty lil cupcakes!.. 2. 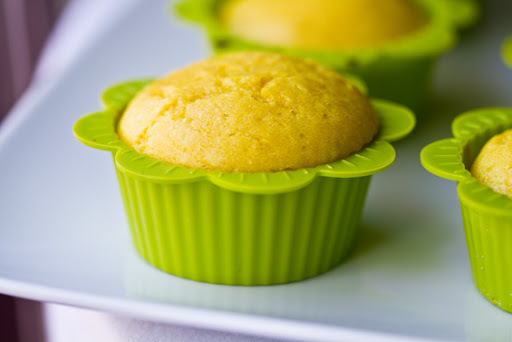 In a large bowl, combine the dry cupcake ingredients. Fold in the wet ingredients and stir until well blended and smooth. 3. Pour cupcakes and bake for 18 minutes - or until baked through. Cool. 4. 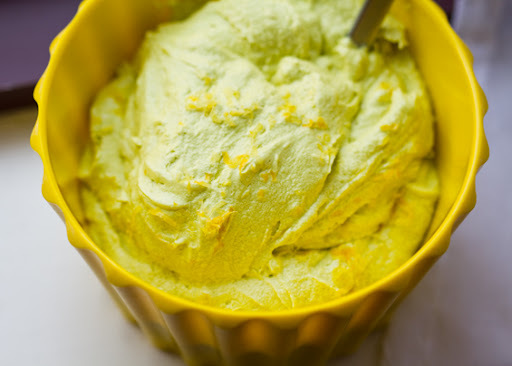 For your frosting, blend together ingredients with a hand mixer until smooth. 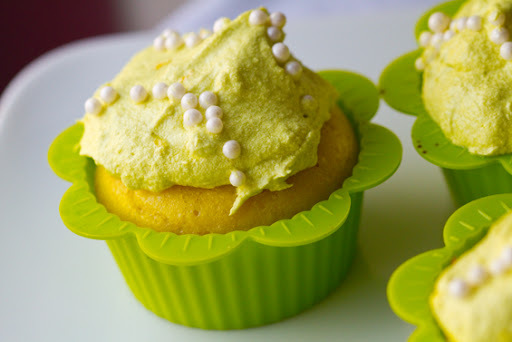 Blend in the food coloring until your desired color is reached. 5. Chill frosting in fridge until cupcakes have cooled. 6. Frost cupcakes. Add white tennis ball lines. Serve! Or chill in the fridge until ready to eat.